Ganesha, or Ganapati, is probably the most beloved of the Gods. He is the remover of obstacles, the god of learning, and the one whose name is taken before beginning anything. The primordial sound 'Oum' is attributed to him, and one of his many names is 'Omkara'. Ganesha is also seen as a benevolent god, and is often a favourite with children. They are also fascinated by the unlikely seeming form- one with an elephant's head, a large belly, and with a mouse as a vehicle to boot. Many of his stories have a childlike quality of fun. Meera Uberoi's book has many of these stories. Some known, some not so well known. That Ganesha was the one who created the first tabla when his irate father Shiva broke his mridungam into two? That Vyasa overcame a bad case of writers' block after invoking the help of Ganesha? That Ganesha is wedded to Siddhi (accomplishment) and Buddhi (intellect)? That Ganesha won a race for going around the world against his brother Skanda, once by going around his parents, a child's world, and once by going around the world in his mind, by reading up all of the available knowledge about the world? That Ganesha swallowed and contained the demon of anger, Krodhasura (krodha=anger), who was destroying the world, and that is the reason why he has a belly that hangs down (Lambodara)? "Even today, anger must be swallowed to control it, just as Ganesha did." These and many other tales make up this collection of stories. 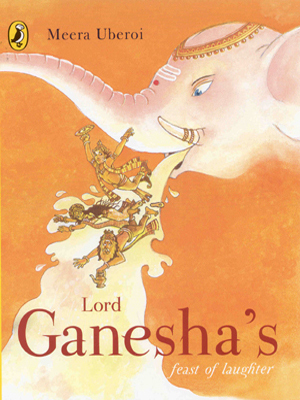 There are also some folktales about Ganesha other than the usual tales from the Puranas, which makes the collection complete- mythology and folklore. Meera Uberoi's narration is very endearing, in terms that children use as a matter of course. "Shiva's wife, Parvati, daughter of Himalaya with its sparkling streams, was pretty easy-going but disliked being disturbed when she was bathing. And Shiva never seemed to remember that. He strode in whenever he wished, cool as you please, and this really annoyed Parvati." 'We-e-ell,' drawled Ganesha, scratching one large ear, 'you didn't say which world. Parents are a child's world, so I walked around our parents--thrice.' Seeing that his brother was ready to explode, he piously added,'The scriptures say so. Ask Father.'" A loved the book, and was giggling throughout. She has recommended it to all who would like to read fun-filled tales about the elephant god, whose birthday is today, Ganesh Chaturthi. If A recos it, then we must get it real soon! Sounds good - will add it to our burgeoning Ganesha collections - we are Ganesha lovers here.